Perfect Keto Review - What Are the Best Ketone Supplements? 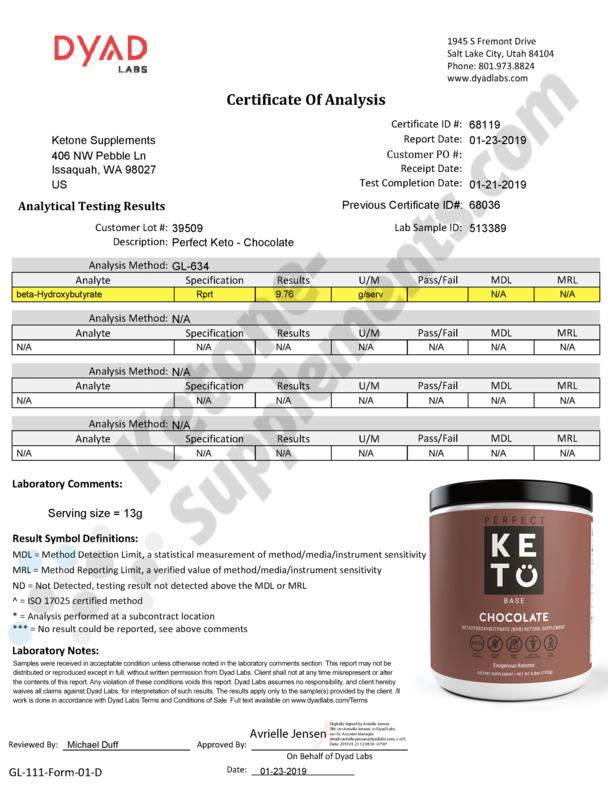 Perfect Keto's Exogenous Ketone Base has been around for a few years now so we'd thought we'd give you a much needed update. Perfect Keto is marketed as a supplement that will help you “Get Into Ketosis” and promotes “Effortless Fat Loss”. While we do LOVE ketone supplements we have mixed feelings about claiming that anything promotes "effortless fat loss". Since writing our initial Perfect Keto Review, this statement has since been removed from their website (silent applause). The new claims on their website are "doctor developed" and "research backed". So just to clarify these for the keto newbies, ALL keto supplements that contain goBHB are "research backed". That is a blanket statement that applies to any company that licenses the goBHB patent. This includes our 'Top Rated' Ketone supplement Ketond, as well as many of the products in our Top Rated list. You will be hard pressed to actually find a ketone supplement that doesn't use goBHB (except for scammy keto pills). As for "doctor developed"... well, the guy behind Perfect Keto is a Chiropractor which is technically a doctor. Is it a doctor that should be giving nutritional or dietary advice? I'm not sure. Does it qualify him to develop nutritional supplements? Again, I'd lean towards no. It does qualify him to say "Doctor Developed" though, so I guess that's a win for Perfect Keto. Now, I'm not bashing Chiropractors because they do improve the quality of life to their patients. I have seen a chiropractor on many occasions BUT I don't go to them because they are experts on formulating or developing nutritional supplements. I just have an issue with a lot of the marketing surrounding these supplements. So, let's get into the details of Perfect Keto. What's 'Special' About Perfect Keto? We've already mentioned that the majority of ketone supplements (perfect keto, ketond, etc.) all contain goBHB. 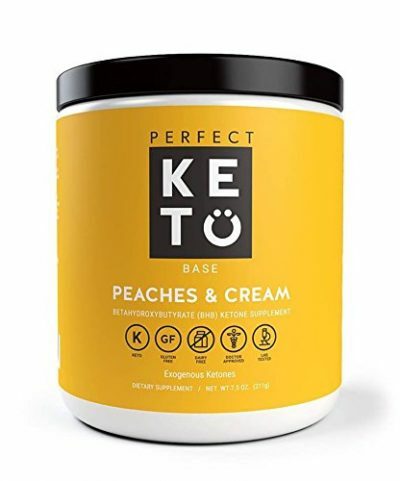 Perfect Keto contains a BHB blend that consists of 11,380mg of goBHB. That seems to be in the standard range. Ketond, our #1 rated ketone supplement, contains 11,700mg of goBHB so Perfect Keto is close and the difference is pretty negligable. Just like our other 'Top Rated' supplements, Perfect Keto contains natural sweeteners and no fillers. This has become par for the course as these keto and goBHB products are really a 'premium' supplement. How Does Perfect Keto Taste? I purchased their "chocoloate" flavor. Now, I should use the term "chocolate" loosely because it honestly tasted nothing like chocolate. The flavor and taste was so bad I couldn't get it down. I thought it was just me so I let the other guys and girls in the office give it a go. Nope. It wasn't just me. I have been taking and testing supplements for a LONG TIME and have been able to get down most of them. BUT the Perfect Keto Chocolate was just nasty. To this day, I have the jar sitting on my shelf. It's a reminder of what a supplement SHOULDN'T taste like. So nasty. Is Perfect Keto a "Good Value"? Honestly, no. It's not a good value. If you can withstand the taste, then you are stuck knowing that you just spent close to $60 for ONLY 15 Servings of a supplement that contains 11,380mg of goBHB. In comparison, our Top Rated supplement, Ketond, contains 30 servings (of deliciousness I might add) at 11,700mg per serving of goBHB for about $65. That's ONLY $5 more for more BHB and 15 MORE SERVINGS! At first glance a lot of people might gravitate towards Perfect Keto. They see the price at $50 compared to $65 for Ketond and think they might be getting the 'same thing' for less. That's not the case as we explained above. Only 15 servings compared to 30. Then the taste! Good night. There is a reason why Ketond is #1 on our list. There are a lot of 'meh' ketone supplements out there. Perfect Keto is one of them. It contains the right ingredients in a decent dosage. It was just undrinkable. So, I don’t know if it’s “wishful thinking” or “enhanced marketing claims” but if you are looking for “effortless fat loss” then simply taking Perfect Keto and expecting a miracle might leave you feeling hustled. Perfecto Keto sells for $59 for 15 servings, so about $4 per unbearably bad serving.